Please check out our previous celebrations posts for finding more magical ways to celebrate special moments while in Walt Disney World. Many Disney Wedding couples will find themselves planning returning trips to celebrate their anniversary, and often trying to find a special way to mark each passing year. Disney World offers many options both large and small for celebrating anniversaries. When my husband and I decided to return for our 1st anniversary, the wheels started spinning. 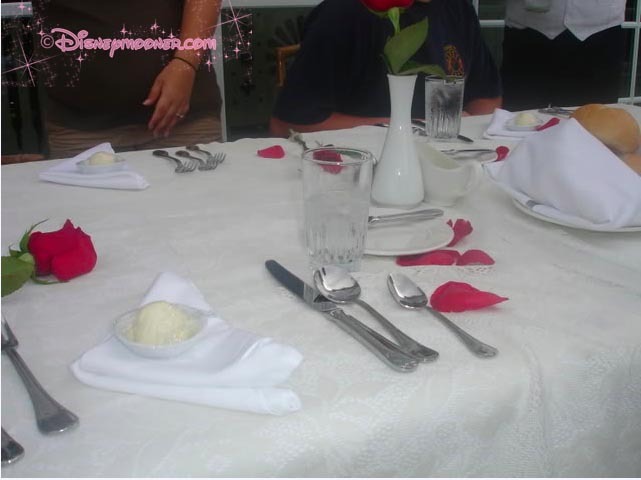 With the help of the Disneymooners and the forums, I uncovered many options for planning unique anniversary dinners. I wanted this all to be a surprise so that was the hardest part. After a few months of thinking over what I really wanted to do, I decided on planning a private dinner for us at the Grand Floridian. Many people don’t realize that it’s as simple as contacting private dining at the resort you are staying to set up something truly unique. 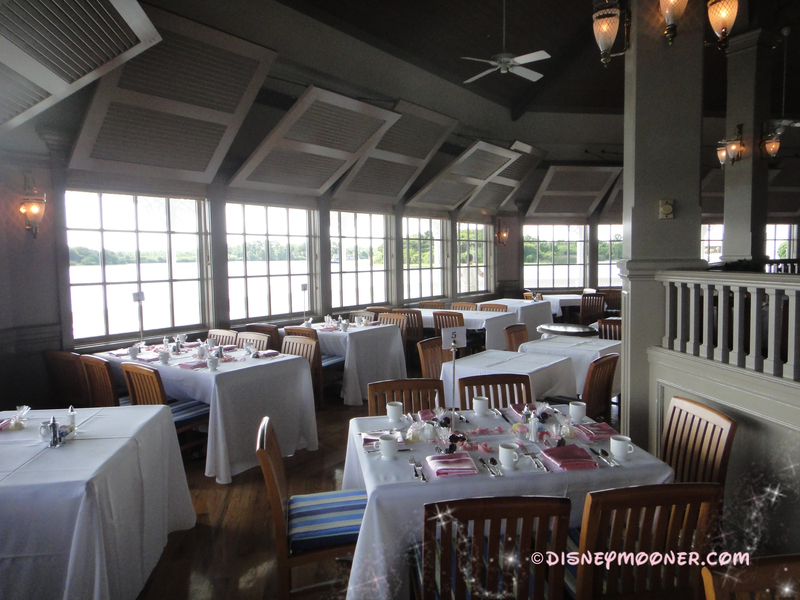 I contacted the Grand Floridian Private dining several months before and we set out to plan the event and the dinner menu. I wanted to try and recreate our dinner menu as close as possible. In the end, Disney went above and beyond my expectations for this. Once we arrived at the Grand that evening, I actually wasn’t certain where I was going, until I noticed a BUTLER! standing by the piano with a tray of drinks and roses. I was shocked and knew it was for us. He was great and it made the evening seem so private for us. He led us to the 3rd floor concierge elevator and out the doors to the terrace. This was where we were eating. So we saw our table all set up and say down to relax as our butler brought our food. This was the closest we would get to having our wedding. It was actually pretty close except for the appetizer. 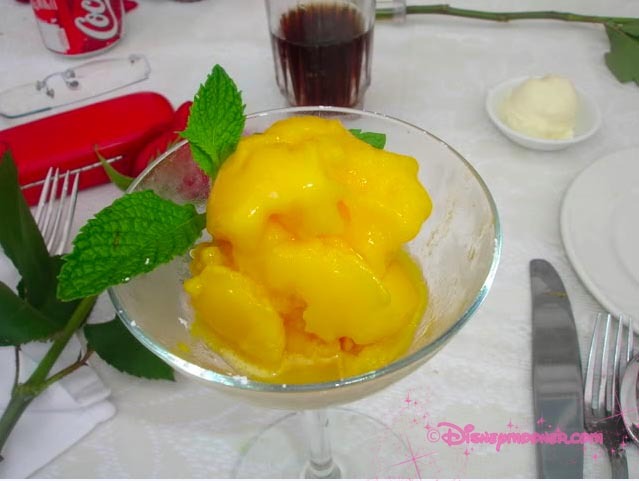 The sorbet was much different than what we had but they made it fresh! The taste was incredible. 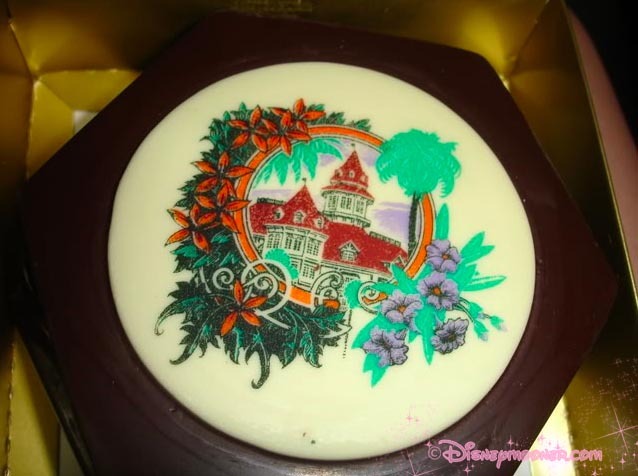 The Butler gave us this for dessert, which was so sweet. Overall, this experience was a great one and worth the money we spent. We would have spent the same amount at any of the fancier restaurants on property. My favorite wedding memory and many of my guests favorite memory too happened during our first dance. We had our reception outside at the Whitehall Patio and as we were sharing our first dance the monorail stopped and everyone on board waved. It was magic that you would only get at Disney and it was amazing. 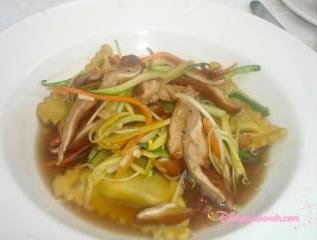 My guests were loving it! I felt things had come full circle. 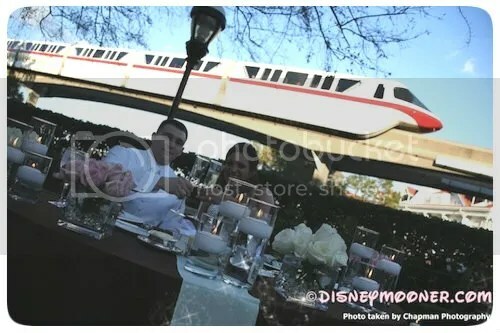 As a kid I dreamed of a Disney wedding going by the pavilion on the monorail and now I probably created that dream in the minds of the kids on board LOL. At least I’d like to think so! Thank you for sharing your favorite moment Gina. 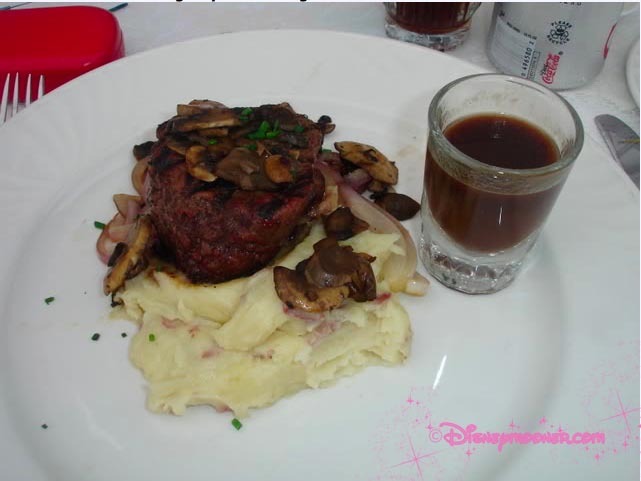 To read more Disneymooner’s favorite moments please visit our forums. 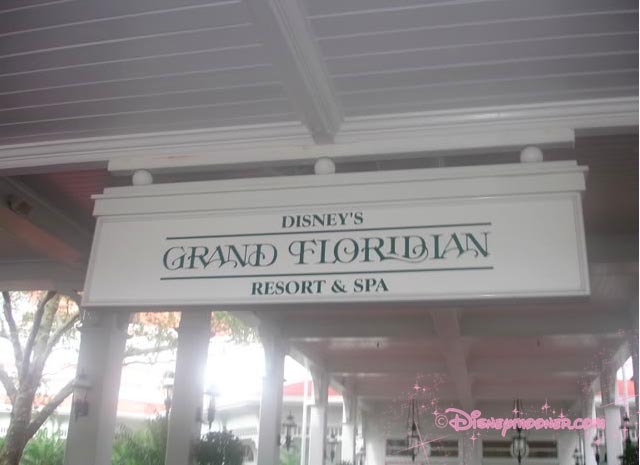 Personally I loved the trip with Harlan after we got married over to the Grand Floridian in the Coach, just having experienced it and his reaction, not to mention some private time with him was nice. Thank you for sharing your favorite moment Tiffani. 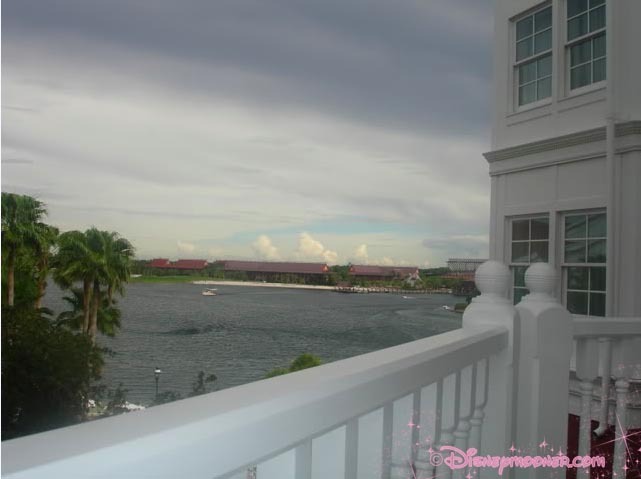 To read more Disneymooner’s favorite moments please visit our forums. 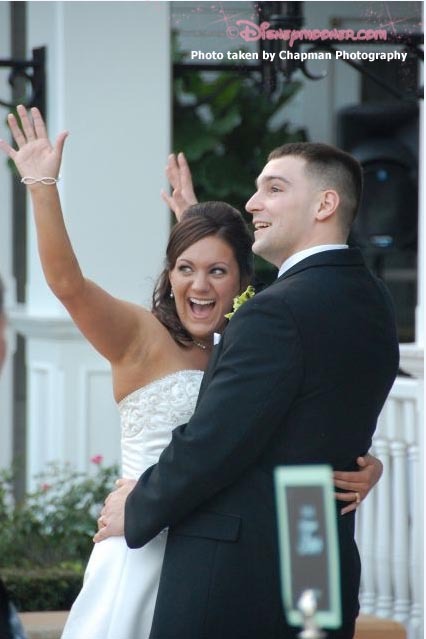 Disneymooner, Gina, and her husband, Steve, were married at Disney’s Wedding Pavilion on January 5th, 2009. 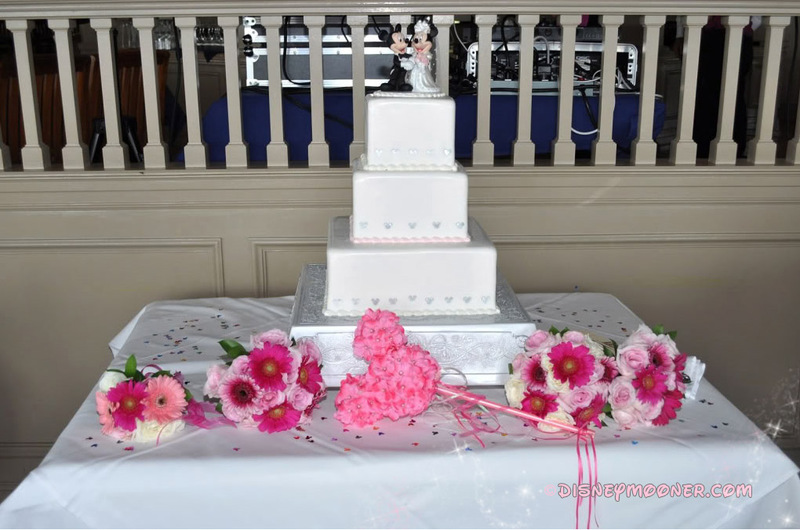 They had their reception at the Whitehall Room and Dessert Party at Sago Cay Pointe at Disney’s Grand Floridian Resort. Disneymooners: Tell us a little about yourselves! Gina: Hi! I’m Gina and I am an attorney; my husband Steve is in manufacturing management. I law school during the wedding planning. We live in Connecticut with our two cats Shooter and Deuce. Besides Disney we love hiking, biking and being outdoors in general. 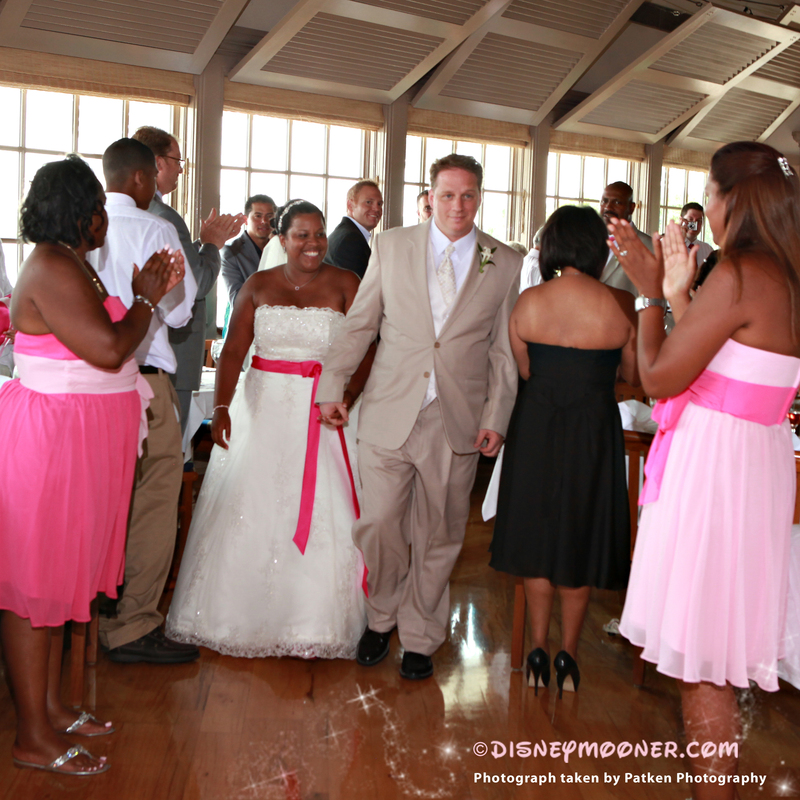 Disneymooners: What made you decide to have a Disney wedding and why? Gina: I have been obsessed with Disney for as far back as I can remember and I took Steve along for the ride. When he proposed I just knew we had to be married at the Wedding Pavilion no matter what it took. I had always commented whenever we went by on the monorail. I’d say “How amazing would a wedding be there?” or “We’ll get married there someday”. When we got engaged and started seriously planning we realized that, hey, we could have a Disney wedding!!!!! The pricing was similar or even LESS than what a wedding would be here so why not follow our dreams and just do it? Disneymooners: How did your friends and family respond when they found out you were having a Disney wedding? Gina: We gave them PLENTY of notice, about 2 years. We knew it was a long way to travel and we knew they’d need some time to prepare. At first I think they might not have thought we were serious but as time went on they knew that we were going to do it. We told everyone that we’d understand if they couldn’t make the trip but we’d love to have them there. Everyone who mattered came and no one gave us a hard time about it. In fact, more people than we thought would make the trip made it which was heartwarming and special to us. 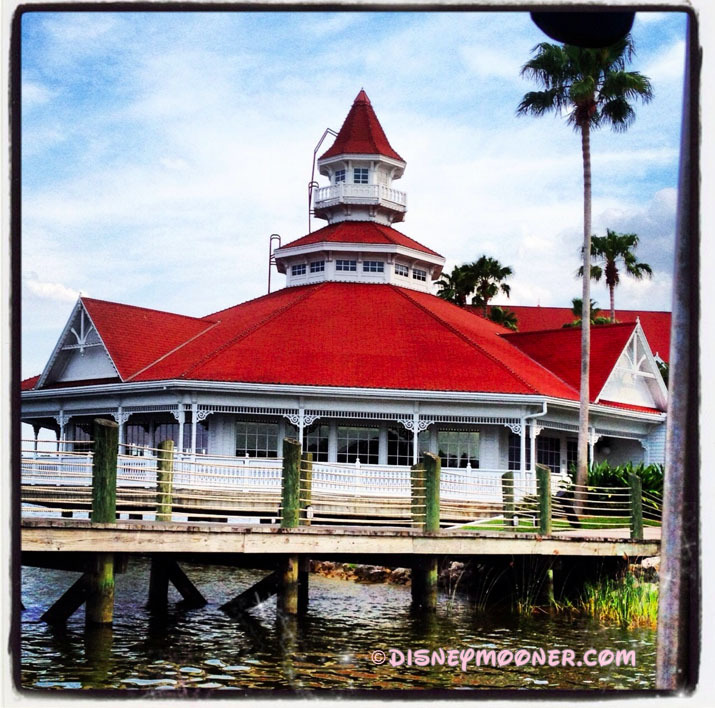 Disneymooners: Was there any particular reason why you chose your venue locations? Gina: We had the wedding pavilion in mind for a while and I knew I wanted to try and host an outdoor reception. We went and looked at a few spaces and like the Whitehall Patio best for that purpose. We had a small wedding so we did not need a large space. That area just seemed to fit our small group perfectly and had sort of a blank canvas look to it which allowed us to get creative in the décor. I knew my Disney wedding would not be complete without a fireworks dessert party. During my planning I’d seen many Disney couples’ photos of Illuminations parties and really wanted similar photos. We toured the areas available to us with such a small group and were not in love with them. On the way back to Franck’s with the planner Steve said “Is there anywhere we can watch Wishes from?” and she said “As a matter of fact there is” and took us right to Sago Cay. It was perfect. Walking distance from Whitehall with a view of our favorite fireworks show. SOLD! 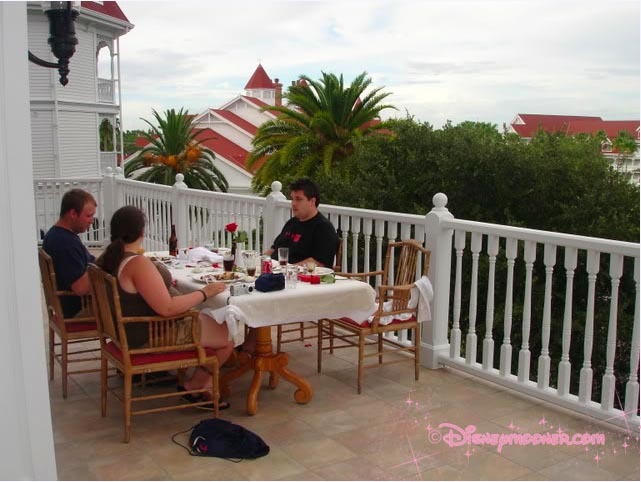 Disneymooners: Planning a wedding, especially long distance, can be stressful for a couple. They wonder how it will all look in the end. How did it feel for you when you saw it all come together on your wedding day? Gina: Overwhelmed with happiness, everything was exactly how I pictured it or BETTER. When I walked out onto the patio, before my guests went out and saw the linens, candles and floral I just smiled ear to ear. Everything was just how I wanted it Carol, my planner, and Elizabeth from floral exceeded all of my expectations. I looked around and simply couldn’t believe I was there. Was this really my Disney wedding? Had we really accomplished this dream? Were all of our loved ones really there to join us?! Surreal. Disneymooners: Was there anything that surprised you? Maybe something that you didn’t expect to have such a huge impact on the day? Gina: Steve and I were lucky enough to experience the most magical moment during our reception. As we danced our first dance on the patio below the monorail we were surprised to look up and see that the monorail had stopped and everyone on board was waving! All of our guests were laughing and smiling and waving up to the people on board it was just magic only Disney could provide. I still think of that moment often when I think of our wedding and our guests still mention it when they bring up the wedding. I like to think I am responsible for creating the dream of a Disney wedding in one little princesses mind who was on board that day. 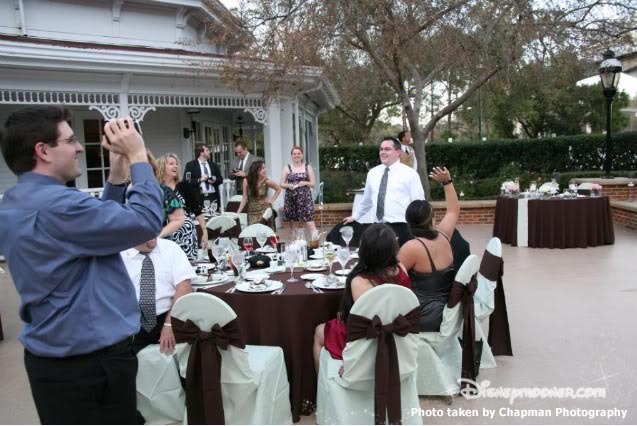 Disneymooners: Part of the excitement for a lot of couples is to see their guests react to the magic of a Disney wedding. What aspect of your wedding do you think your guests loved the most? Gina: I think they loved the monorail moment mentioned above the most. I also think they really loved finishing the night off with desserts and fireworks, those seem to be the moments that people remember most. 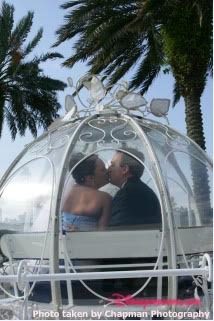 I think many did not know what to expect from a Disney wedding and lots of them expressed to me that they were so thrilled at how nice it was. 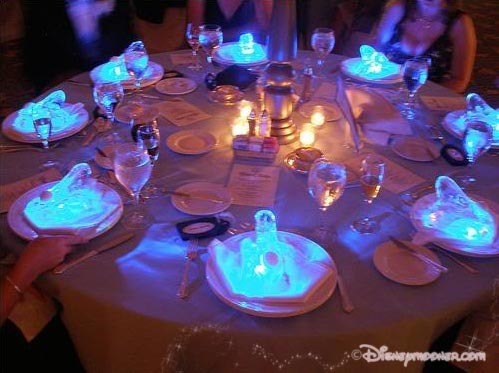 Disneymooners: What was the #1 splurge you had that you couldn’t imagine not having on your wedding day? Gina: The dessert party. Just book one. Now! It was perfect and made for some amazing photo ops. I think desserts and fireworks are uniquely Disney. Sure, some other places can provide similar experiences by Disney does it best! 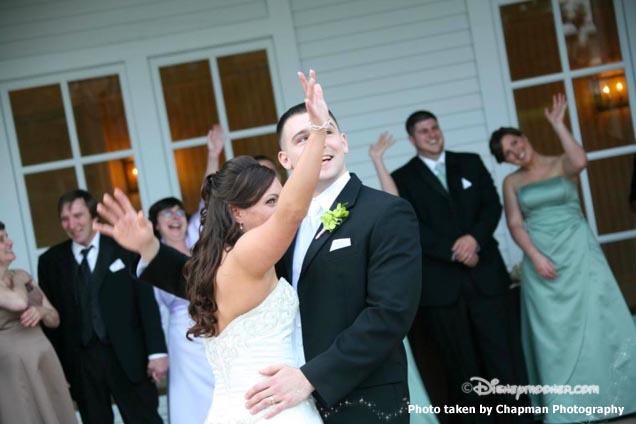 Disneymooners: Tell our members about the top 3 things that you’re glad you did for your wedding. Had a dessert party with fireworks. Followed our dreams. Do not worry what others think about your wedding choices just do what you want and it will all work out in the end. Everyone worth it will be there and will have fun! Disneymooners: Was there anything that you wish you had done? Or wish you had done differently? Gina: I wish we had a character but budget just did not allow and I also sometimes wish we would have had the Cinderella carriage but again it was too expensive for us at the time. Lastly, I wish my Magic Kingdom photo was not cancelled. One week before the wedding Disney Photo called me and said they couldn’t do it for us because there was going to be construction going on and they could only reschedule 2 weeks later when we were back home. That was a bummer. I’d love to have had those photos. Disneymooners: Photography is very important to all brides. Was there a particular shot that you knew you absolutely had to have to document your day? Gina: Not really. I didn’t ask the photographer for any particular shots. I just went with it. Disneymooners: Do you have any words of wisdom to our future brides? Gina: Follow your dreams. Plan the wedding YOU want. Do not worry about anyone else’s desires. It’s your day. Stay calm, let your planner take care of you, they will make sure everything is perfect. All you need is faith, trust and pixie dust! This week’s Venue review was written by Disneymooner Lianne. To read more about her wedding and see her recaps please join out private forums. 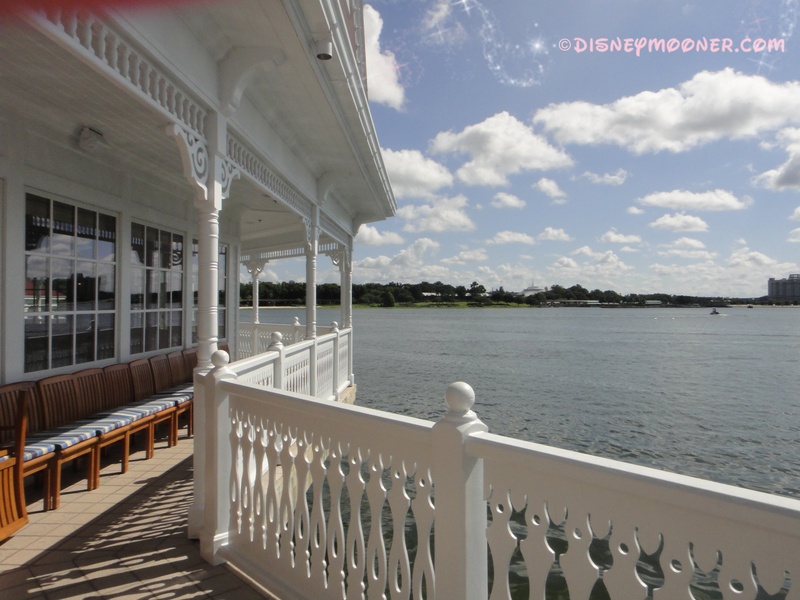 Narcoossee’s is located at Disney’s Grand Floridian Resort and is a great choice for the bride and groom who want to have great views of the Magic Kingdom, close to the Wedding Pavilion, and has lots of natural lighting as there are windows all around. You can comfortably host about 75 guests in the area and still have room for dancing. The restaurant is so beautiful, that it needed minimal decoration… it’s octagonal shaped with windows on all sides. We chose this venue because we only wanted to have our reception in a place that had lots of windows and natural lighting, so that basically narrowed it down to three venues; the California Grill, Narcoossee’s and Atlantic Dance Hall. California Grill was going to be under construction during our wedding, so that was out, and so we looked at Narcoossee’s and ADH during our PS. We really liked both venues but felt that our wedding was only going to be about 50 people, so Narcoossee’s was perfect! 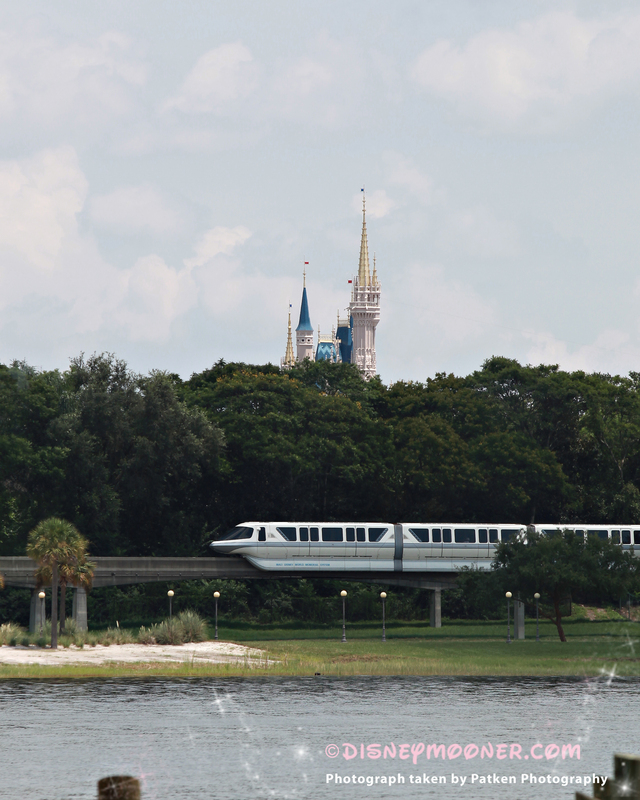 In the distance is Cinderella’s Castle, reminding you that you’re in the place where Dreams Come True! They even had chairs outside so you can enjoy the view of the Castle and the water. 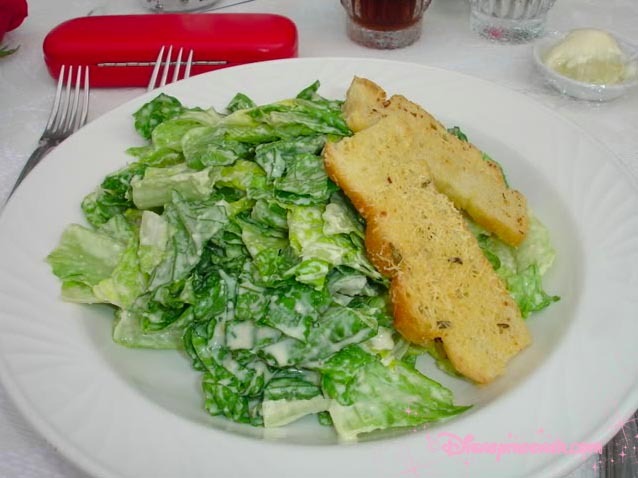 We loved everything about Narcoossee’s, and on every trip to WDW, we have dinner there! Don’t forget to join the fun on the Disneymooner Forums.